It's been a while, but it's back in a big way. 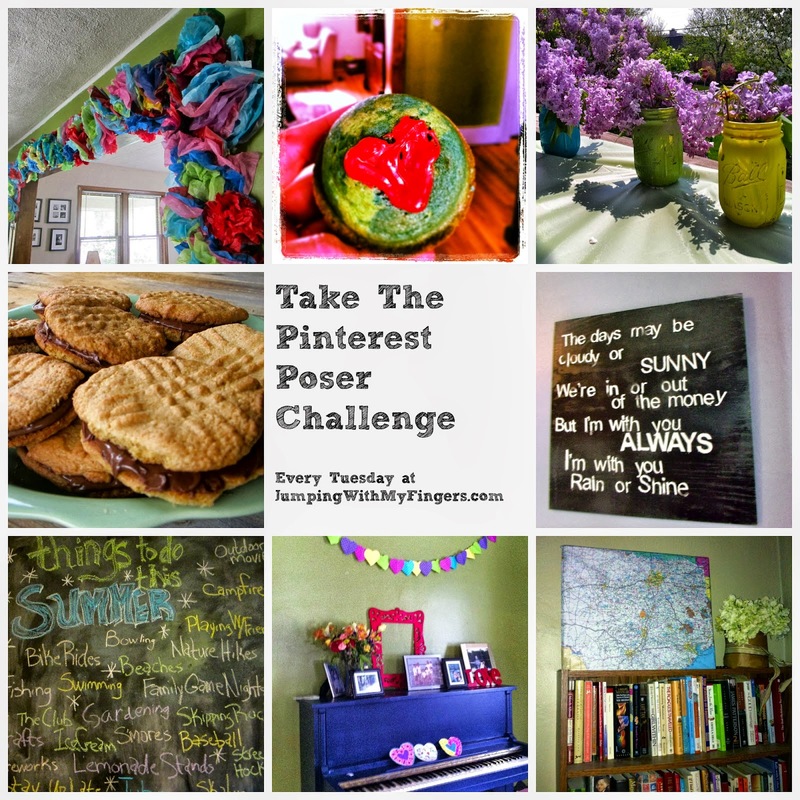 It's Pinterest Poser Challenge* time! Woot. Woot. I've missed crafting and painting so much. So this weekend, when we had a little time, I told Tim that I needed to "paint something, anything!" *In an attempt at not being a Pinterest Poser,** every week I attempt and detail a new Pinterest challenge (a recipe, craft, etc). I saw this project on Pinterest and thought that maybe I could do it. I wish I were a gardener, I have a whole Pinterest board dedicated to it. Alas, I am not a gardener. But this year thanks to the Poser Challenge, I hope to add a few more herbs to my meals this summer. This project was super easy and cheap. Check it. I bought very cheap pots at Home Depot for $1.98 each. I also purchased a few of my favorite herbs, also for a couple dollars each. I painted the body of the pots with old chalkboard paint that I already had. 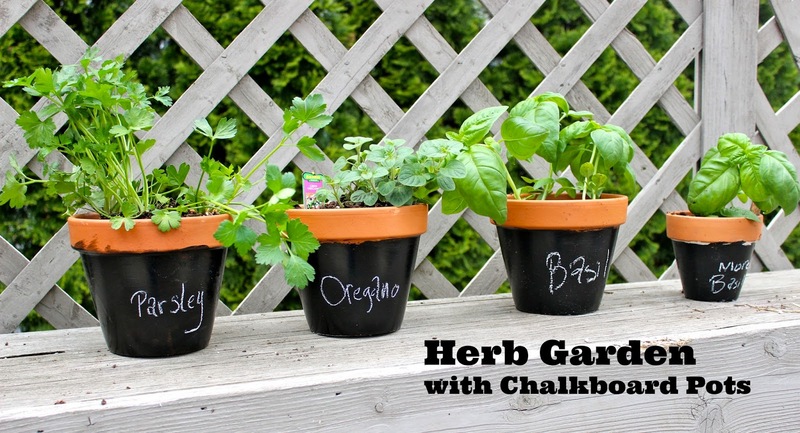 I planted the herbs into the pots after the paint had dried. Then I labeled each pot. I'm a huge basil fan and I really don't think there is a better smell. Tomato, Mozzarella, Basil salad here I come. I love the show Parenthood. The dialogue, the realness, the writing, the acting and the set....all amazing. 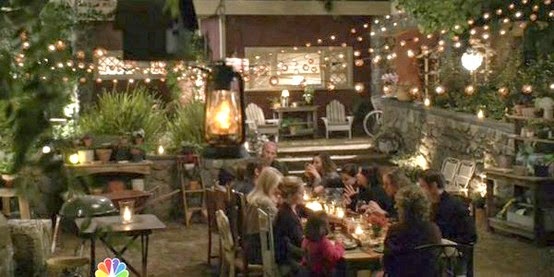 Since I started watching the show, I've been obsessed with the the outdoor dinner parties they have with all the outdoor lights. Family dinner scene from the show. So awesome. 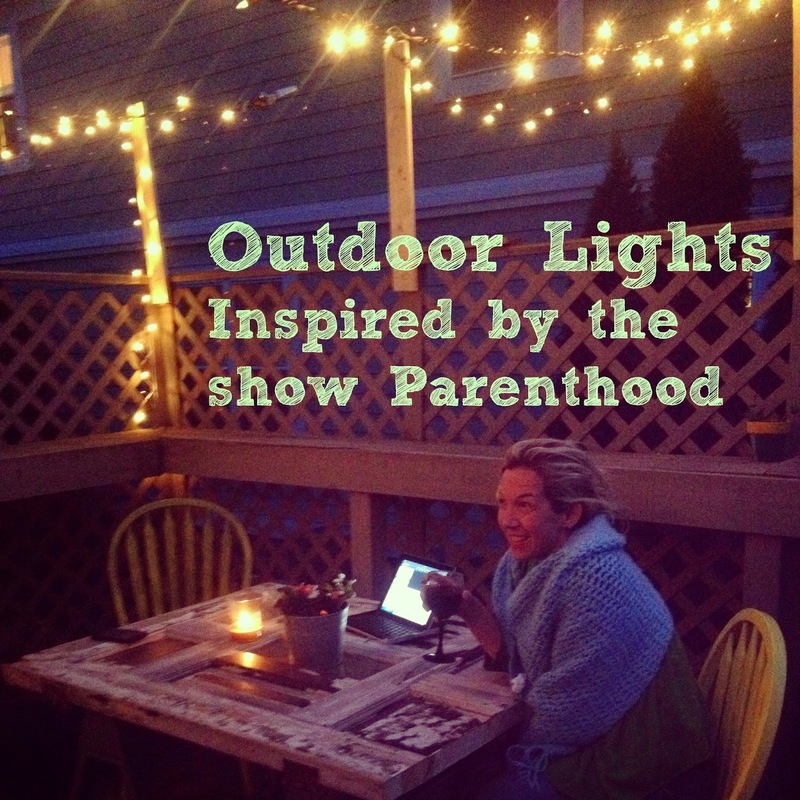 So, this past weekend Tim and I attempted to totally copy Parenthood's lights. It is part of what I like to call "Our Tacky Deck Makeover." Phase one included flowers and Parenthood lights. While we were at Home Depot getting herbs, we also got flowers, one very long 1 x 4 and lots of string lights. 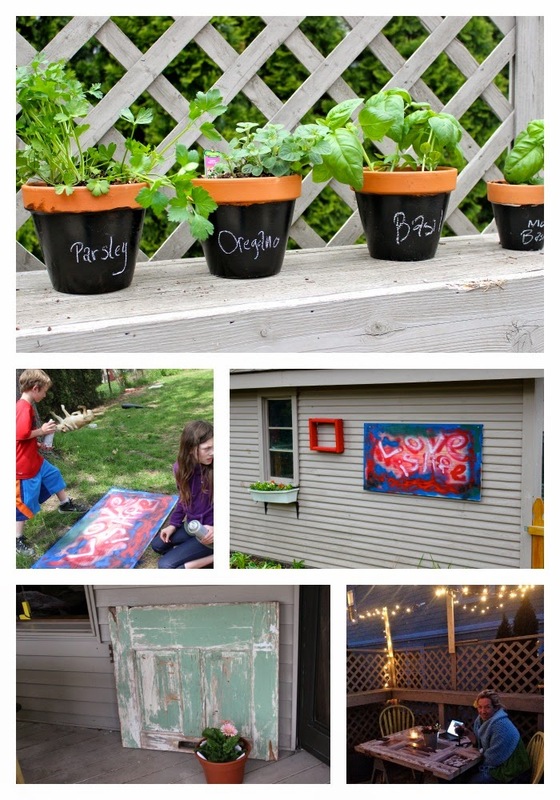 Once we got home, we put everyone to work--planting and cutting and stringing. I was the visionary and Tim was the project manager. He helped JT cut the 1 x 4 with the scary saw. He drilled the wood into our existing deck fence/lattice thing-y. He then hung the lights. He attached the lights to the 1 x 4 posts he nailed into the fence by looping the string around a screw. He bought clamps that stuck right to the gutter to hold the other side of the lights. I love the way it turned out. I also love that this little part of the makeover was so cheap. The 1 x 4 cost $7, the screws and clips cost $4 and the lights were $10. Total cost $21. It's my new favorite spot to hang out in and drink wine. We also bought a couple pieces of plywood at Home Depot. I like to have plywood around at all times in case someone wants to build something or paint something or make a sign. So we paid $8 for a small piece of thin plywood for whatever/anything/a sign or something. 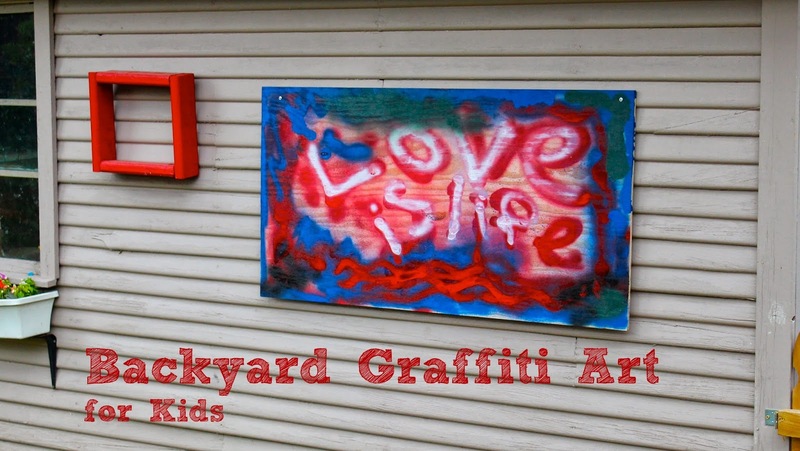 While we were busy with the porch makeover, the kids found a couple cans of spray paint in the garage. 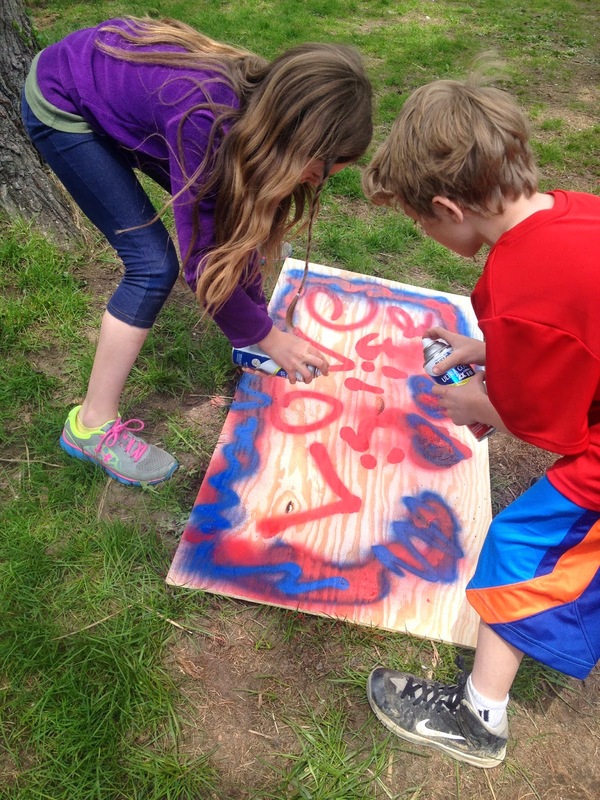 They asked if they could spray paint something and I suggested they make a graffiti sign for the backyard. I told them they could do whatever they wanted. This is possibly my favorite piece of art or craft they have ever done. They worked together and had fun and I think it looks so cool. We hung it on the side of our garage that faces our backyard. Doesn't it look rad? Have you made anything that was Pinterest-inspired or -worthy? Share it in the comments below or over on my Facebook page. Head on over and follow my Pinterest boards- click here! 1. I am totally doing the light thing. We have deck lights, but we need canopy deck lights. 2. We have a big empty space on the back of our house (and the side of our shed!) that is begging for some art. We also have plywood. We might need some spray paint. 3. I love that you used the word "rad" to describe the art. It is, and so are you. I love that you love these! And I love when you comment on the blog Andrea. Thank you for being so supportive and funny and wonderful!!! I have a Pinterest board of Pinterest projects I HAVE tried and another called Pinterest projects I MUST try (because they look easy enough). I am all about lights, always. I love your idea about two Pinterest boards! Oh man i'm about to go down the rabbit hole of all of those projects. Then i'm going to come hang out in your backyard. The sign did turn out much better than I thought it would, I was totally hands off. :) I love your kitchen craftin' and the butterfly project. You guys have so much fun! I love the herb garden, I need to do that as soon as I have a proper house :) Oh, the lights too. And the graffiti board. OMG they're all just awesome. Love the light, love the sign, love it all.